"Genuine parts are designed and crafted with preciseness "
Genuine Eastman parts are only available from authorized Eastman representatives such as IIGM. Inferior substitutes may save you money in the short run, but dependable Eastman quality will protect your investment in the long run. Eastman blades for your straight knife cutting machine feature an exclusive heat-tempering process that hardens the blade's cutting area while maintaining flexibility in the blade's tang. Every Eastman blade is precisely machined to hold critical tolerances of plus or minus .001 inches. The poor quality and inconsistent thickness of generic blades accelerate the wear and tear on critical parts such as the slides, crosshead and guides. A part that is only a few thousands of an inch out of tolerance can cause a major machine failure. The resulting increase in maintenance and down-time more than offsets the non-genuine blade's cheaper price. 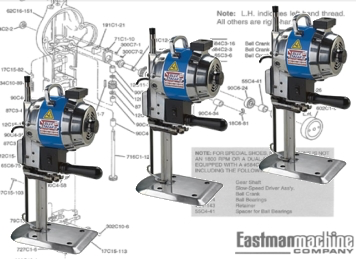 Consumable Eastman replacement parts for low-ply automated cutting systems fit not only Eastman, but virtually all models of "pizza wheel" type automated cutting systems. Eastman rotary blades can be used as replacement blades for Gerber cutting systems and are also compatible with Olfa, Fiskars and Kai blade holders. Punches and notching tools are machined to exact specifications and are available in 15 variations. Marking tools such as the Fisher 2.7-inch pressurized plotter pen refills are available. *NOTE: Please contact IIGM or view our online parts portal to purchase.